The 2017 road cycling calendar – where have the changes happened? 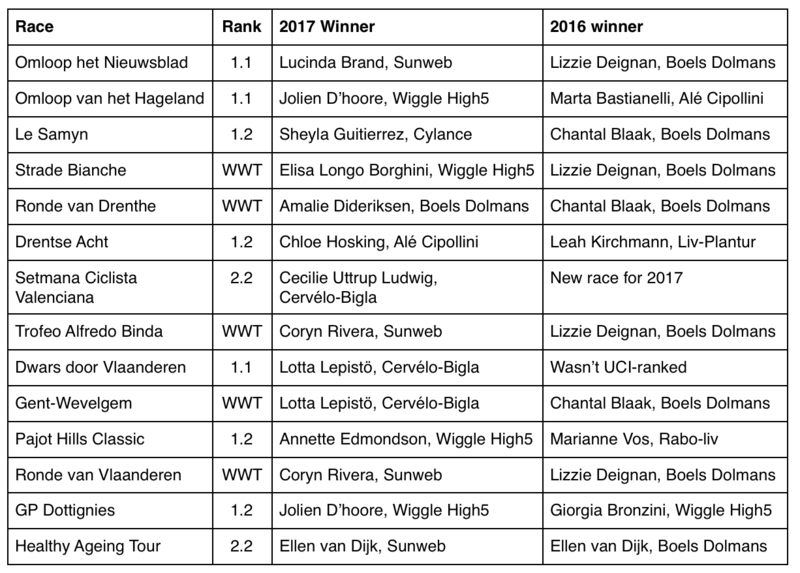 I’ve been looking at the 2017 women’s road cycling calendar – in Part 1 of this series, I looked at how 2017 compares to 2016 (and how the 2016 calendar changed between) publication and racing, and in Part 2, I looked at how 2017 fits into the patterns of numbers of races over time. Now, I’m going to look at where the changes have happened, and the implications for the women’s calendar as a whole. So here’s how the races have changed since 2006. I used 2006 as my base year, the first time I started this research, as it was the first full year of races logged on CQ Ranking, but it’s useful as it includes three Olympic years, and as you can see, there’s been an upward trend on most continents, but there tends to be a large increase in the Olympic year, then a reduction the following year, and a slow climb to the next Olympic year. I am in the middle of having a look at the UCI women’s road calendar for 2017, and one of the things I like to do is to look at each year in the context of recent history. I think it’s important to see what the trends are, and what things mean for the calendar. In Part 1 of this year’s work, I looked at the chaos of the 2016 road calendar, and how many changes there were between the calendar being published in October 2016, and what was actually raced. As well as that, I looked at how the 2017 is different to 2016. – and this time I’m going to put that in the context of research I’ve already done.